Below is another scan from Debbie's mom's collection of '30s and '40s memorabilia. The Chuck Wagon Gang is still going strong (I wonder what the original group would have thought about the idea of a website? ), billing itself as "the oldest recording mixed gospel group still performing with ties to the original founding." The scan appears to be a promotional flyer, on heavy card stock, and it highlights the group's appearances on the era's Big Dogs of Texas radio: WBAP (Fort Worth), KPRC (Houston), and WOAI (San Antonio). The "Bewley" in the name refers to Bewley Mills, a flour company. What was it about flour companies that made them sponsors of musical groups on the radio? 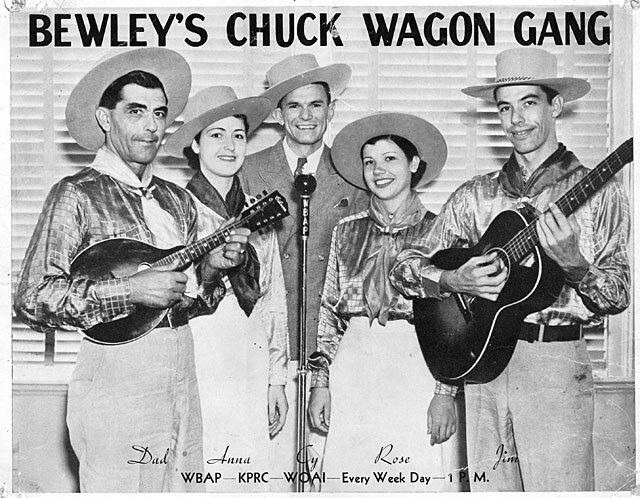 According to the group's website, at one time the Chuck Wagon Gang was Columbia Record's second highest selling artist, behind only Xavier Cugat and just ahead of some upstart hillbilly named Johnny Cash. An interesting tidbit is that even back then, musicians assumed different names for their public personae. In the case of the CWG, Dad was Dave Carter, and he was the father of Anna (real name Effie), Rose (Lola), and Jim (Ernest). I have no idea who Cy is...perhaps the announcer? This page contains a single entry by Eric published on October 17, 2010 7:23 AM. Fair Weather Fan was the previous entry in this blog. And...another stroll down memory lane: Wiley Walker & Gene Sullivan is the next entry in this blog.